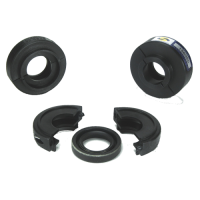 Spare Seal Carrier Kit for a SureSeal, StrongSeal or Rudder with a 7/8 Inch Shaft. This unit comes with one 7/8" Lip Seal and 1 Protective Cover that keeps the Lip Seal spinning with the shaf.. Spare Seal Carrier Kit for a StrongSeal or Rudder 1 Inch Shaft. This unit comes with one 1" Lip Seal and 1 Protective Cover that keeps the Lip Seal spinning with the shaft and protects it from dama.. Spare Seal Carrier Kit for a StrongSeal or Rudder 1 1/8 Inch shaft. This unit comes with one 1 1/8" Lip Seal and 1 Protective Cover that keeps the Lip Seal spinning with the shaft and protect.. Spare Seal Carrier Kit for a StrongSeal or Rudder 1 1/4 Inch Shaft. This unit comes with one 1 1/4" Lip Seal and 1 Protective Cover that keeps the Lip Seal spinning with the shaft and protects it f.. Spare Seal Carrier Kit for a SureSeal, StrongSeal or Rudder 1 3/8 Inch Shaft. This unit comes with one 1 3/8" Lip Seal and 1 Protective Cover that keeps the Lip Seal spinning with the shaft and pro.. Spare Seal Carrier Kit for a SureSeal, StrongSeal or Rudder 1 1/2 Inch Shaft. This unit comes with one 1 1/2" Lip Seal and 1 Protective Cover that keeps the Lip Seal spinning with the shaft a.. Spare Seal Carrier Kit for a SureSeal, StrongSeal or Rudder 1 5/8 Inch Shaft. This unit comes with one 1 5/8" Lip Seal and 1 Protective Cover that keeps the Lip Seal spinning with the shaft and pro.. 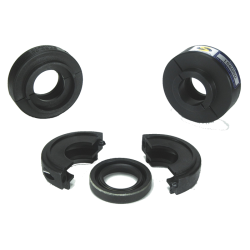 Spare Seal Carrier Kit for a SureSeal, StrongSeal or Rudder 1 3/4 Inch Shaft. This unit comes with one 1 3/4" Lip Seal and 1 Protective Cover that keeps the Lip Seal spinning with the shaft and pro.. Spare Seal Carrier Kit for a 2 Inch Rudder Stock. This unit comes with one 2 Inch Lip Seal and 1 Protective Cover that keeps the Lip Seal spinning with the shaft and protects it from damage from du.. Spare Seal Carrier Kit for a 2 1/4 Inch Rudder Stock. This unit comes with one 2 1/4 Inch Lip Seal and 1 Protective Cover that keeps the Lip Seal spinning with the shaft and protects it from damage.. Spare Seal Carrier Kit for a 2 1/2 Inch Rudder Stock. This unit comes with one 2 1/2 Inch Lip Seal and 1 Protective Cover that keeps the Lip Seal spinning with the shaft and protects it from damage.. Spare Seal Carrier Kit for a 2 3/4 Inch Rudder Stock. This unit comes with one 2 3/4 Inch Lip Seal and 1 Protective Cover that keeps the Lip Seal spinning with the shaft and protects it from damage.. Spare Seal Carrier Kit for a 3 Inch Rudder Stock. This unit comes with one 3 Inch Lip Seal and 1 Protective Cover that keeps the Lip Seal spinning with the shaft and protects it from damage from du.. Spare Seal Carrier Kit for a 3 1/4 Inch Rudder Stock. This unit comes with one 3 1/4 Inch Lip Seal and 1 Protective Cover that keeps the Lip Seal spinning with the shaft and protects it from damage..